Pancreatic cancer is a hideous disease; I am doing everything possible to raise awareness and research funding. You can support research into curing pancreatic cancer via the Lustgarten foundation, and/or the Pancreatic Cancer Action Network (PanCAN) . 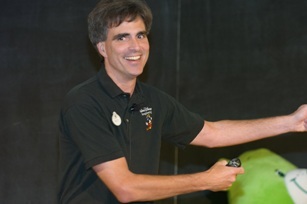 The "Last Lecture", given at Carnegie Mellon University (76 minutes) My lecture on "Time Management:" at the University of Virginia. Roughly an hour; the first eight minutes are introductions I don't deserve. Chinese translation here. Diane Sawyer of ABC (and her incredible producer, Geoff Martz) did an hour special, which was way too flattering. 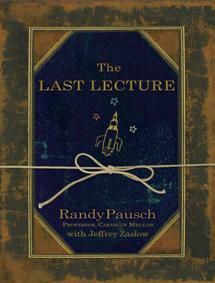 Here it is: Hyperion is publishing "The Last Lecture" as a book on April 8th. Click here for details. I am very psyched I got them to put "Carnegie Mellon" on the cover! To download a copy or order a DVD of "The Last Lecture". You may use the video for non-commercial purposes without asking for permission*. Transcripts and videos in other languages. The book will be available April 8th; details at: www.TheLastLecture.com . If you're in Pittsburgh and need a good counsellor/therapist with experience with families with cancer, I recommend Michele Reiss. * The video and transcript will technically be under a "creative commons" license, which will be a legal way of saying that you may use them for non-commercial purposes, so long as you don't alter them, and you give attribution. Please bear with me; figuring out that legal stuff is secondary to my other priorities.